MegaJackpots Wheel of Fortune On Air is based on the famous gameshow and has 5 reels and 20 paylines. Created by IGT, it focuses on the infamous wheel which can give you big cash prizes or entry to 4 more bonus features where you can benefit from transforming mystery symbols, wild reels, respins with sticky wilds and access to the MegaJackpots Bonus feature where a life-changing progressive jackpot is up for grabs! 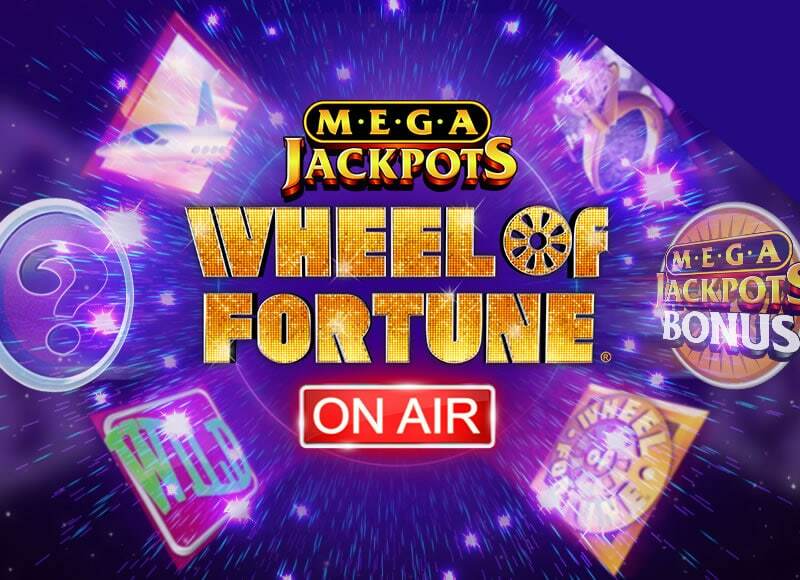 MegaJackpots Wheel of Fortune On Air is 5 reel, 20 payline slot which is powered by IGT. Playable on all devices from 40p to £800 per spin, this gameshow inspired title is all about the Wheel of Fortune Wheel feature where you spin the infamous wheel to give you cash prizes or access to 4 more bonus features. Visually, you will recognise the Wheel of Fortune gameshow when the slot starts – with a showbiz feel, the reels resembled the TV show’s board. With A, K, Q and J royals on the reels, you will also come across sports cars, diamond rings and luxury yachts. The private jet is the most rewarding symbol giving you 7.5 times your stake for 5 on a payline. The wild performs all the usual replacing duties and pays up to 30 times your stake for 5 in combination. Mystery Transform feature – up to 6, 11 or 14 Mystery symbols will appear to give you a better chance of winning big. Wild Reel feature – 3, 4 or 5 reels turn completely wild. 5 wild reels will result in a 600 times stake payout. Respin feature – 3, 4 or 5 respins are awarded. The triggering bonus scatters become sticky wilds with any new wilds landing also becoming sticky for any respins that remain. Multiplier feature – you will get a stake multiplier basically that can reach up to 10 times your stake in the Wheel, 50 times your stake in the Super Wheel and 250 times your stake in the Ultra Wheel. Lastly, there’s the MegaJackpots Bonus feature – if triggered, you get 1 spin of the MegaJackpots Bonus wheel. This contains 24 envelopes with either a MegaJackpots token or cash prize. The Ultra Wheel has 3 MegaJackpots tokens meaning 3 chances to win the life-changing progressive jackpot. MegaJackpots Wheel of Fortune On Air is actually quite an enjoyable slot – the bonus features are good and the variance is low to medium meaning plenty of value for your bankroll. I triggered the Wheel of Fortune Wheel feature fairly frequently too which helps. I like the Wild Reel feature where 5 wild reels will give you 600 times your stake. It’s all about the MegaJackpots Bonus feature though which is highly unlikely – we can still dream though. I suggest you try other MegaJackpots slots from IGT with MegaJackpots Isle O’ Plenty recommended.